The Aquios AQFS236 is designed for homes larger than 3000 square feet or in situations requiring higher flow rates. As a combined filtration and softening solution, there's no need to worry about multiple systems to provide clean, soft water. The AQFS236 will prevent harmful hard water scale from forming on your pipes and other plumbing fixtures while eliminating chlorine odor and taste. The larger diameter housing is equipped with a built-in bypass and shut-off valve. It supports our 4.5" cartridges which utilize a solid carbon block with a salt-free, food grade additive to soften your water at the point of entry. Our cartridge is rated for up to 6 months and filters your water to a 1 micron level. The Aquios AQFS236L is similar to the AQFS234L but comes with a built-in bypass and shut-off valve already in the head assembly. The AQUIOS® salt free water softening and filtration system utilizes natural, commercial strength technology and performance in a sleek, compact design. 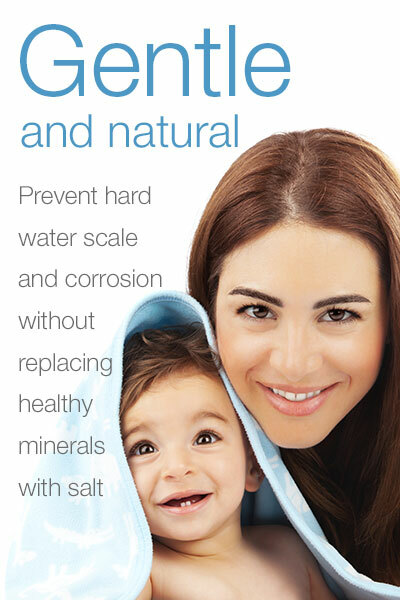 This system will ensure that sediment, chlorine, chloramines and other undesirable materials are removed from your water, that calcium, magnesium and other minerals found in hard water do not build up and create scale on your fixtures and pipes, and provide clean, pure and healthy water to you and your family. Unlike salt-based systems, the minerals that make water “hard” are not removed. Instead, AQUIOS® utilizes a commercial, natural technology that ensures that these minerals do not accumulate or build up on faucets, water heaters, shower heads, internal pipes or any other device that utilizes your existing water source. This natural technology is a polyphosphate additive known as Siliphos which inhibits scale deposits and, over time will slowly reduce scale buildup on your pipes and appliances. The result...most scale-causing minerals pass through the systems instead of forming deposits on pipes, appliances and water heater. The larger diameter housing supports our jumbo cartridges which utilize a solid carbon block with a salt-free, food grade additive to soften your water at the point of entry. Our cartridge is rated for up to 6 months and filters your water to a 1 micron level. The AQFS236L comes standard with 1-1/2" ports but is available with 1" ports upon request.